Moon gardens are designed for nighttime relaxing. Filled with light-colored plants and other objects that catch the light of the moon, they are a serene sanctuary for unwinding from a stressful day. There are three basic components to designing a moon garden: plants, hardscaping, and accessories. How elaborate you get with any of these depends on your time, budget and personal tastes. The emphasis in moon garden plants are those with light-colored flowers as these will glow in the light of the moon and appear to hover above a background of dark foliage. There are thousands of options for white, yellow and cream-colored flowers, but since these come and go during the season, it's also nice to have a number of plants with light-colored foliage that will show up in the moonlight. Few plants have purely white foliage, many plants have silvery grey foliage which shows up just as well. 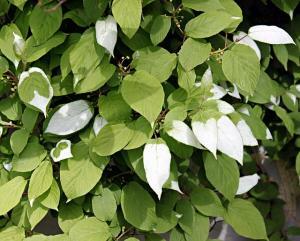 Also look for species with variegated foliage as the light-colored portion of the leaves will pop out at night. Finally, no moon garden is complete without fragrance. A select number of plants bloom only at night or are more fragrant at night than during the day, so be sure to include at least one of these. Hardscaping often conjures up fancy paving and patios, but in essence it refers to any permanent structure in the landscape. 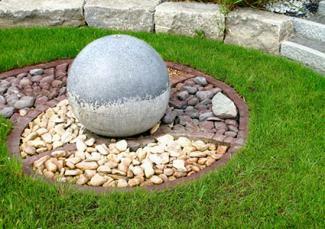 When it comes to a moon garden, there are two special rules that apply to hardscaping. There should be a place to sit and relax. A simple bench is fine, but there is nothing against a gazebo, hot tub or other more elaborate outdoor environments. The use of light-colored materials should be emphasized. 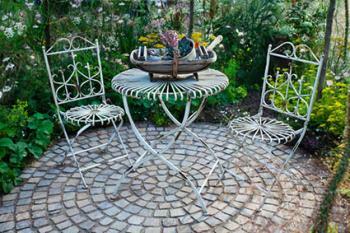 If flagstone is used for a path or patio, use the lightest flagstone you can find. Marble chips are probably the whitest possible surface for pathways, but light-colored pebbles are also effective at catching the moonlight. Beyond these two basic considerations, your choices in hardscaping will differ little from any other type of garden design. It is often the smallest touches that make any garden magical. With a moon garden, you want to focus on objects with a reflective surface and themes related to the moon, stars and nighttime in general. Consider outdoor art and statuary that fits this description, but don't limit yourself to a literal interpretation of the concept. You might incorporate stone or woodwork that includes round, spherical, crescent or star shapes. A simple gazing ball is a natural choice because of its spherical shape and glossy surface. A small reflecting pool or fountain is also an excellent choice as the water will reflect the light and the sound will add to the ambiance. Finally, a subtle lighting scheme is a great way to accentuate a moon garden. Bright lights that overpower the moon and stars should be avoided at all costs, but tiki torches, candle lanterns and small LED lights on the ground or strung up in the limbs of a tree add considerably to the ambiance. There are as many ways to design a moon garden as there are garden designers, but the following steps outline the basic process and give suggestions for best results. Remember, a moon garden doesn't have to be big - most people choose to use the theme in one small part of the yard centered around a seating area. Choose an area with open access to the sky and away from streetlights or other sources of artificial light. Parts of the yard with overhanging branches are ineffective for moon gardens because the light can't get through. Lay out paths, seating and other hardscaping first. 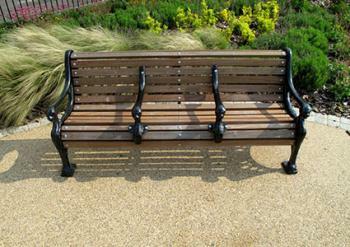 A simple approach is to have a short meandering path that leads to a bench or other destination for sitting. If you're going to have a deck or patio, this should be roughly in the center of the space with the plants clustered around it. The seating area could be at the far end from where you approach or it could be in the middle. Structure the plantings so the shortest species are toward the center, fading to taller species at the periphery. By no means does every plant need to have light-colored flowers or leaves, but it's most effective if at least half of them do. It's helpful to plant an evergreen hedge around at least a portion of the moon garden to provide a sense of enclosure and privacy. 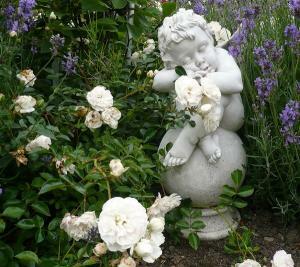 Position at least one accessory item as a focal point in the landscape, such as statuary, a fountain, a gazing ball or a light-colored boulder. It's usually most effective if this is not precisely in the center of the space, but off to one side. It should, however, be in full view of the sitting area. Then add in any other accessories you like, such as lighting or hanging decorations. 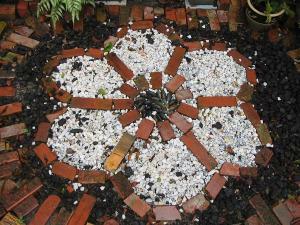 Use the basic steps outlined to create a moon garden design in your own yard. 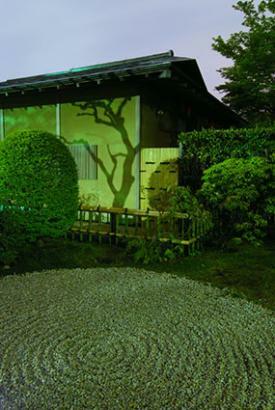 For a hybrid Zen-like moon garden, use light colored pebbles or crushed rock for the central open area, which can be raked into a pattern in the traditional way of Zen gardens. Incorporate small boulders within the rock groundcover as accents and place small pagoda style candle lanterns on top of each one for a subtle lighting effect. Use light-colored foliage plants of varying heights around the periphery and a single white flowering Japanese cherry off to one side as a focal point. A simple, low budget design is to forego any type of hardscaping and use an oval-shaped patch of lawn (or an area mulched with wood chips, pebbles or crushed rock) in the center of the garden instead. 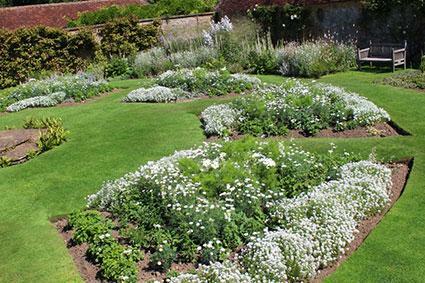 Place plants in roughly concentric rings around a central seating area, alternating flowering species with foliage plants. Place tiki torches to mark two wide ends and the two narrow ends of the oval. Completely enclose the space with plants, trellises, or other screening materials to create the moon garden as a distinct outdoor room. In this case, you can use a gate or arbor at the entrance and cover it with a white-flowered vine, such as moon flower. At the far end of the garden, opposite the entrance, string up low wattage LED lights along the tallest plants in a roughly crescent-shaped pattern around that end of the garden. There are hundreds of potential plants that can be used to create a moon garden, but here is a short round up of some of the most popular. Add these lovely blooms to your garden plans. 'Iceberg' Rose (Rosa spp.) 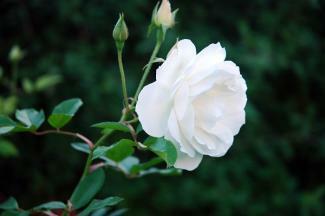 is a pure white variety known as one of the most disease resistant, easy-to-grow roses, 'Iceberg' also blooms repeatedly and profusely throughout the summer, making it a standout in the moon garden. It grows well in USDA zones 5 to 10. 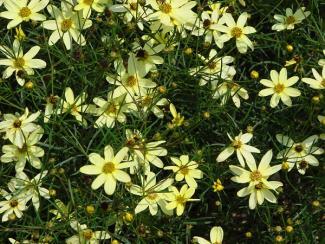 'Moonbeam' coreopsis (Coreopsis verticillata) is a long-blooming perennial with butter yellow flowers that really glow in the moonlight, this type of coreopsis grows in tidy mounds about 2 feet tall and wide. The plant is hardy in USDA zones 3 to 9. These plants have foliage that will pick up the moon's glow. Lamb's ears (Stachys byzantina) grows to about eight inches tall and will spread rapidly to cover a large area if desired. 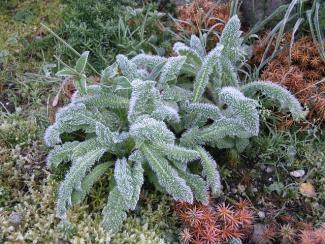 Try this fuzzy silver leafed plant as a groundcover in the moon garden or for edging along a pathway. 'Silver Carpet' has lighter colored leaves than some of the other lamb's ear varieties. It's hardy in USDA zones 4 to 7. 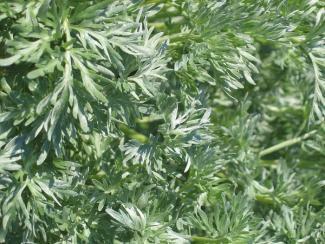 Artemisia 'Powis Castle' (Artemisia spp.) has silvery foliage and is highly fragrant when touched. It grows about two feet tall, but up to six feet wide, making it a great filler in between flowering perennials in the moon garden. Grow it in USDA zones 4 to 10. Add some lovely scents to your moon garden with angel's trumpet and moonflower. Angel's trumpets (Brugmansia spp.) 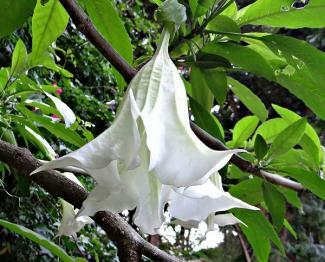 are subtropical evergreen shrubs with large pendulous flowers in the shape of a trumpet. The flowers are open day and night, but the fragrance is most powerful after dusk. Angel's trumpet comes in many colors, so look for white varieties like 'Kyle's Giant White', and use them along the back border of the moon garden or as a small patio tree in cold climates (keep them in a pot so they can be brought indoors for winter). Grow it in USDA zones 8 to 11. 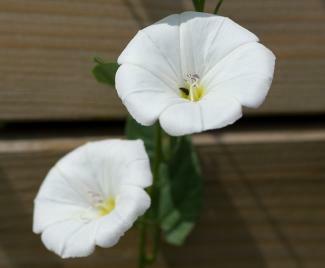 Moonflower (Ipomoea alba) is a vine that's the ultimate moon garden plant. The six-inch pure white blossoms open only at night, fading by dawn, and emit a delicious fragrance. It is a tropical relative of morning glory vines and can grow up to 12 feet in a season, so be sure to provide ample trellis space. As a perennial, grow it in USDA zones 9 to 11 or it can be grown in all zones as an annual. There is perhaps nothing more romantic, or relaxing, than a warm summer night spent basking in the glow of the moon. Surrounding yourself with beautiful, fragrant plants that reflect the moonlight is an unforgettable way to enjoy time spent with a loved one.